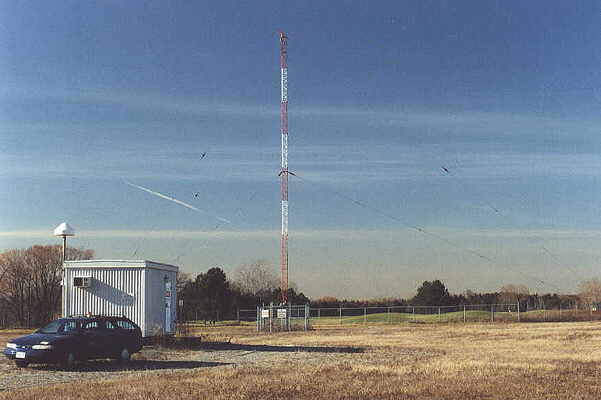 Moorabbin Aerodrome NDB (Victoria, Australia) – MB – on 398 kHz is one of the few remaining Australian NDB in this frequency range. MB runs 100 watts 6K00A3E into a top-loaded vertical typical of many Australian NDBs. The beacon uses MCW for ident & also has ATIS (recorded voice information for the aerodrome). The aerial is essentially a 21 m vertical wire with a folded 3-wire loading structure about 70 m long over a ground system of ~ 60 x 40 m radials. See http://www.airwaysmuseum.com/NDB%20BLT%202-05.htm for the style. 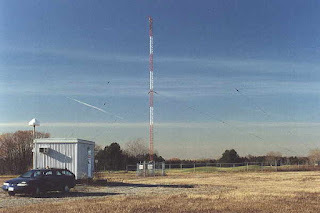 The transmitter hut and ACU at that url is also typical of our NDBs.